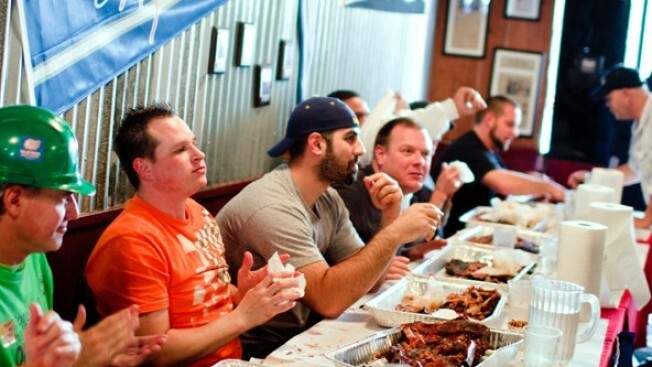 A rib-eating contest is the center of an afternoon-long celebration. A rib-eating contest is one centerpiece of the 2012 Chinatown Springfest. It's on Sunday, April 15. If we were to play the ol' "which one of these things doesn't belong" game with the following words, we'd probably be stumped. Here they go: ribs, festival, strolling, beers, music, sunshine, Chinatown, Sunday. They all go together, right? There isn't a single concept that doesn't click with the rest. Meaning that Springfest, an afternoon-long party in Chinatown's historic core, is sure to draw plenty of pedestrians ready to hang out. The date is Sunday, April 15. Well, and eat ribs. There is a rib-eating competition at the center of the day -- Spring Street Smoke House is behind the bbqing -- and there will be some serving of craft beers, too. And a bunch of local bands providing the walk-around soundtrack; think The Sloths, The Blessings, and such. A Springfest rep points out that the party coincides with CicLAvia, and Chinatown happens to be on the route. So if you're tooling around on your bike during then cycle-sweet event, make plans to park your wheels under the neon for an hour or two. The party puts us to thinking about the late-night, late-summer soirees Chinatown has been hosting with great success and attendance. Which puts us in mind that summer is not too far off. Which makes us want to look at the weather, which makes us happy, since April 15th looks perfectly springlike and outdoorsy. Our earlier-in-the-week will have wrapped and the livin' will be sweet 'n easy. And meaty, too, if you sign up for the rib contest in advance.